This oil blend is an excellent addition to your skin care routine. All of the oils in this blend are anti-inflammatory, balancing, antiseptic, and soothing to the skin. This blend works particularly well for anyone suffering from skin irritations such as eczema, dermatitis, and acne. It is an excellent oil blend for aging skin and helps keep skin looking young. *note: I received this product for free. I only promote products that I use and love. There are affiliate links in this post, click here to learn more. 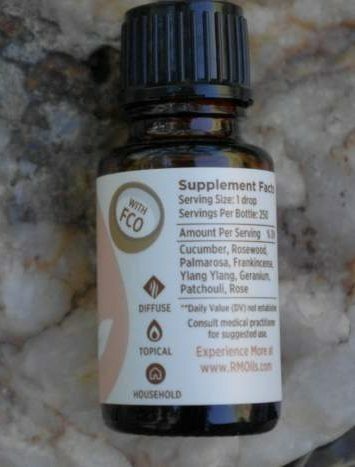 Rocky Mountain Oils (RMO) is determined to develop essential oils that are pure and safe to use for the entire family. They are dedicated to formulating expertly crafted blends and the purest single essential oils available. RMO is always inovating and expanding its line with new oils to satisfy the most experienced consumer and to help introduce new consumers to the health benefits of essential oils. 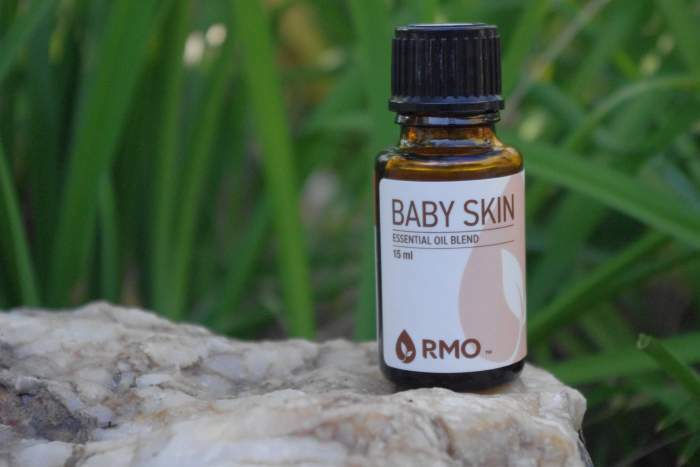 RMO is My Favorite Essential Oil Brand. Click to Find out Why. Rocky Mountain Oils sent me some free oils to try out and I have to say that the quality is awesome! The aromas are lovely, and there is no hint of rancidity. 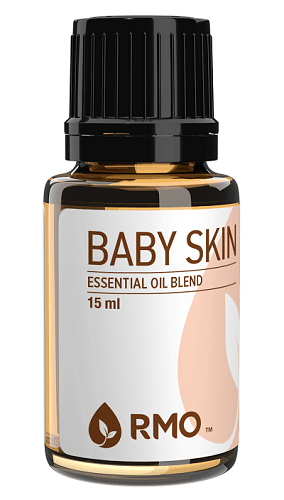 I have used the Skin Care blend and really enjoyed it, now I am trying out Baby Skin. When I first got this oil, I figured - because of the name - that it was meant for use on babies. After reading about the different oils contained in it, I figured it must be called "Baby Skin" because it helps keeps skin youthful. The cool thing about RMO is that they have a live chat feature on their site, so if you ever have any questions, you can ask someone for help. 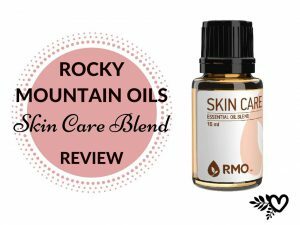 I went to RockyMountainOils.com and asked on live chat about the Baby Skin blend and whether it was meant for babies or not. The chat representative told me that ​RMO mostly designs its blends for adult topical use (though you can use them on children - and RMO even tells you how to dilute them properly). 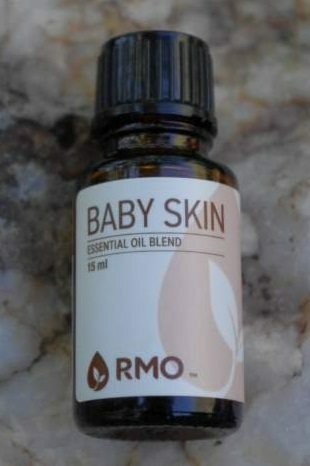 RMO's representative told me that the reason it is called "Baby Skin" is because the oils within it are known to provide amazing moisture and to soften the skin. Using this oil has been a breeze, I add it to my roller ball and apply it like a perfume, or as a spot treatment on pimples. I have mixed it with my red raspberry seed oil and used it as a facial oil, though I prefer the Skin Care blend for that. I love that you can use this oil straight out of the bottle (it is already diluted). I have used it on patches of dry skin and eczema and it really helped speed up healing and reduce irritation. Very floral and sweet, I mostly smell geranium. Customers have remarked that this blend smells like baby powder. Because it is already diluted with fractionated coconut oil, it can be used straight out of the bottle. If you want to use it on children, RMO has a great page on dilution rates for children. Cucumber Seed, Rosewood, Palmarosa, Frankincense, Ylang Ylang, Geranium, Patchouli, & Rose in a base of Fractionated Coconut Oil. This blend contains 40% Fractionated Coconut Oil (FCO). Earthy, herbal and slightly sweet aroma that is useful as a base note. Highly moisturizing, revitalizes dry or damaged skin. Medium-strength floral, sweet, and slightly rose-like aroma​. ​Good for dry or irritated skin. Can improve skin's tone by softening wrinkles and reducing scar tissue. Medium-strength intensely sweet, floral, and rich aroma. Gentle oil that can improve skin's appearance. 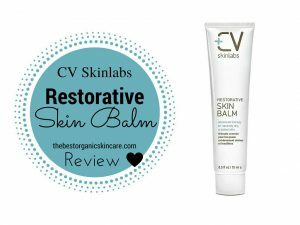 Good for both oily or dry skin types. Medium-strength rich, herbaceous, musky, earthy, and spicy aroma. Softens and reduces the discomfort of chapped, irritated or flaky skin. Helps prevent scars and stretchmarks. Stimulates faster healing of wounds. Medium-strength balsamic, rich, warm, slightly spicy, sweet, and woody aroma. Promotes natural healing of the skin. ​Strong floral, sweet, rose-like aroma. Balances and tones the skin. Useful for both dry and oily skin types. Good for sensitive and aging skin. Odorless carrier oil that deeply moisturizes. Increases absorption of essential oils by the skin. Prevents skin irritation by diluting pure essential oils. ​$19 for 15 ml. Comes in a dark glass bottle. People with acne may not be able to tolerate the base of fractionated coconut oil, as coconut oil is comedogenic﻿﻿﻿﻿﻿ (clogs pores). 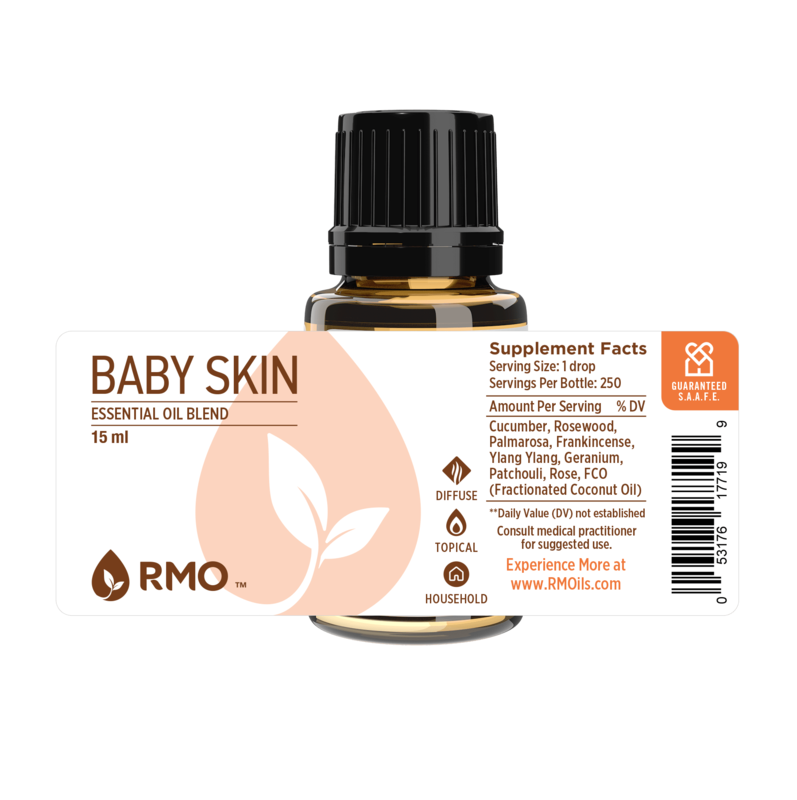 Baby Skin essential oil blend has helped people with eczema and other minor skin discomforts. I have noticed that my skin feels more hydrated and less flaky when I use this oil. How Does Baby Skin Blend Compare to Skin Care Blend? They are both similar in their uses, and they both greatly benefit the skin. A big difference is that Baby Skin is diluted with fractionated coconut oil so it can be used straight out of the bottle. I personally prefer the Skin Care blend for use as a facial oil. I like the scent better, and I like the that it includes carrot seed oil for warding off wrinkles. I do still use the Baby Skin blend, but I use it for dry, irritated skin or eczema patches on my body, rather than on my face. This is a well thought out blend. The essential oils contained in this blend are chosen because they are helpful at healing minor skin conditions. They are all soothing and antiseptic. This is an excellent oil blend to have on hand for rashes, dermatitis, flaking or inflammation. Baby Skin blend can help strengthen and promote healthy skin. I really like using it on any eczema patches or areas of dry skin that me or my children experience. I also like to add it to my ﻿﻿unscented body oil to give a boost of aroma. 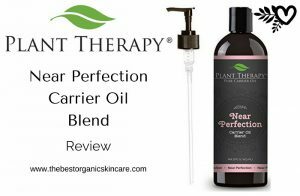 I do prefer the Skin Care blend mixed red raspberry seed oil﻿﻿﻿ for use on my face, I find it to be an exceptional blend for anti-aging (check out my review). I worry that the fractionated coconut oil base of Baby Skin blend will aggravate my acne. This oil blend is an excellent addition to your skin care routine. It is anti-inflammatory, balancing, antiseptic, and soothing to the skin. This blend works particularly well for eczema, dermatitis, and acne. It is an excellent oil blend for aging skin and helps keep skin looking young. Please leave any questions you may have in the comments below 🙂 And Share this article with someone who could benefit from Baby Skin!